One of the items I purchased with my birthday money last summer was this screen door. I had it propped up against the house last summer in a shady spot in my garden. Since the door was green, I got the inspiration to work it into my front door/covered patio Christmas display this year. Here my green screen door with a new Christmas sign made by My Junkin' Friend Jodi of Mann Made Signs. I also added a very festive pair wool stockings. Make your own outdoor greenery pails with my tutorial, here. Every good junk display has to have crates! 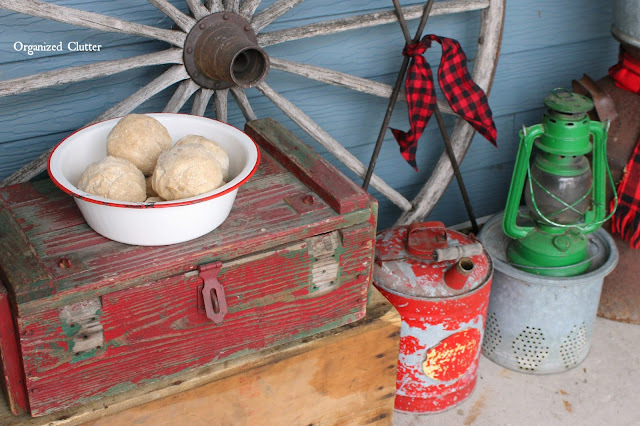 The enamelware bowl has grubby snowballs also made by My Junkin' Friend Jodi. Many of the same items return year after year, lanterns, the wheel, milk cans and minnow pails just arranged a little bit differently. I adore red paid scarves and buffalo check ribbon too. By the way, we already have this in northern Minnesota. I love the unpretentiousness of a Christmas junk display, with it's well worn objects combined with the familiar colors and textures of Christmas. Click here to revisit my 2013 covered patio. Click here to revisit my 2014 covered patio. Oh Carlene - So adorable! Love every bit of it. So Christmassy! love it! you're lucky to have a covered patio to decorate. So interesting Carlene ... The screen door is wonderful and gives height to the arrangement. Everything looks like Christmas with all the red and green. Makes me want to fix my green screen door and put it to use this Christmas. 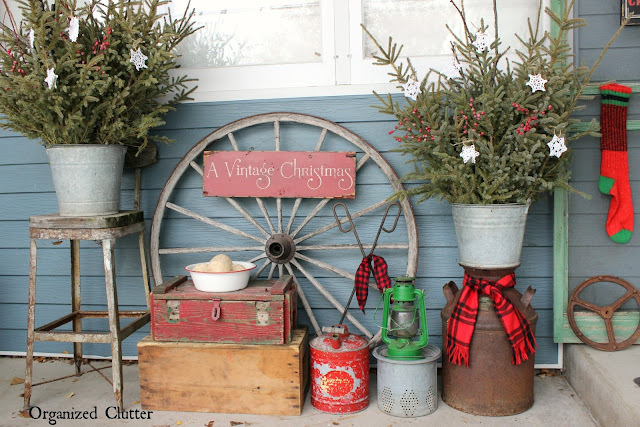 Your outdoor Christmas decor is super cute and sooooo my style!! Happy Thanksgiving! I'd want to leave all this fabulous junk out all year long. LOVE it! Gorgeous, Carleen. I LOOOVE those red and green wool socks. Carlene your arrangement is beatiful, I love it. I love old boxes and that wagon wheel! I love your display. Especially the screen door. I have a black one that I decorate for Halloween. It has bats on it or I could use it for Christmas too. I live in St. Paul. What part of Minn. do you live?